The deteriorating international trade position of the U.S. as documented by the CIA is a national security concern by the U.S. military, according to the Joint Operating Environment 2010 report, or JOE 2010, released Monday by the United States Joint Forces Command, or USJFCOM. The CIA World Factbook lists the U.S., with a negative current account balance of $380 billion, in last place among 183 nations in 2009. China, in contrast, is listed as No. 1, with a positive current account balance of $296 billion. Nor is the United States position in international trade improving. The U.S. Department of Commerce Bureau of Economic Analysis reported in December that the U.S. current account deficit increased to $108 billion in the third quarter of 2009 from $98 billion in the second quarter of 2009. Reviewing the military implications, the JOE 2010 report stressed that the U.S. "chronic trade and current exchange balances have exacerbated both U.S. current account deficits and overall governmental indebtedness such that the amount of U.S. government debt held by foreigners has grown from 1.3 trillion to 3.5 trillion dollars representing 40 percent of total U.S. debt." The USJFCOM points out in the JOE 2010 that total U.S. foreign debt has accumulated to $2.165 trillion, with China holding in U.S. Treasury debt $798 billion of its accumulated $1.95 trillion surplus in foreign exchange reserves. With China holding a balance-of-trade advantage, exporting $270 billion annually to the U.S., while importing $61 billion to the U.S., the U.S. negative foreign exchange position vis-à-vis China is unlikely to change in the near future. With concern the JOE 2010 notes "the emerging scale of U.S. government borrowing creates uncertainty about both our ability to repay the ever growing debt and the future value of the dollar." WND has previously reported that the total negative net worth of the U.S. on a Generally Accepted Accounting Practices, or GAAP, basis was $70.7 trillion in 2009, five times last year's U.S. GDP and $10 trillion more than the world's GDP. The JOE 2010 correctly noted that the unfunded obligations constituting the nation's $70.7 trillion negative net worth are a result of the U.S. baby-boom generation coming of age to receive entitlement benefits in Social Security, Medicare and Medicaid, while the underlying working population that pays to support the programs are declining as a consequence both of demographics and unemployment. With regard to national defense implications of the deteriorating U.S. economic position, the JOE 2010 worried that should China demand higher interest rates as an inducement to continuing to buy the U.S. Treasury debt needed to finance continuing trillion dollar U.S. federal budget deficits, the U.S. could suffer a "hard landing" that could increase the perception the U.S. no longer controls its financial future. Noting President Obama's warning that the U.S. economy will add $9 trillion debt over the next decade, the JOE 2010 warned the result could be "a decreased ability of the United States to allocate dollars to defense." "Rising debt and deficit financing of government operations will require ever-larger portions of government outlays for interest payments to service the debt," the JOE 2010 cautioned. "Indeed, if current trends continue, the U.S. will be transferring approximately 7 percent of its total economic output abroad simply to service its foreign debt." "Unless current trends are reversed, the U.S. will face similar challenges, anticipating an ever-growing percentage of the U.S. government budget going to pay interest on the money borrowed to finance our deficit spending," the JOE 2010 concluded. 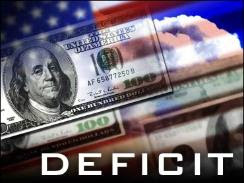 The USJFCOM expressed concern that U.S. current account and federal budget deficits will inevitably mean fewer dollars available to spend on defense. In 1962, defense accounted for approximately 49 percent of total U.S. government expenditures, but by 2008 defense spending dropped to 20 percent of total government spending. "Following current trend lines, by 2028 the defense budget will likely consume between 2.6 percent and 3.1 percent of GDP – significantly lower than the 1990s average of 3.8 percent," the JOE 2010 stressed, noting that by 2028 the Department of Defense could shrink to less than 10 percent of the total federal budget. "The fundamental issues for the Joint Force are the long term sustainability of our current allocation of the federal budget and how we can contribute to continued security while operating within the fiscal constraints that are unfolding."